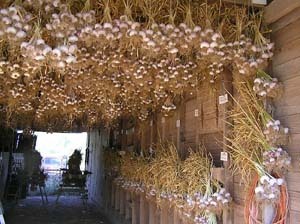 A rich, musky Rocambole hardneck Garlic. A delicious Rocambole that stores as long as any Rocky and while it has an authoritative bite, it is not offensively hot. Armenian ranks 6 to 8 on the garlickiness scale and 4 to 6 on the pungency side, depending on weather during the growing season. Good flavorful Rocky that won't bite you back - excellent for raw eating. It has a very rich, musky, earthy flavor with a healthy bite, if what I taste tested last year was its normal taste.